The Golden State Warriors are the overwhelming favorite to repeat as championships. They arguably have four top-10 players on the roster. But the October coronation may just have to wait. 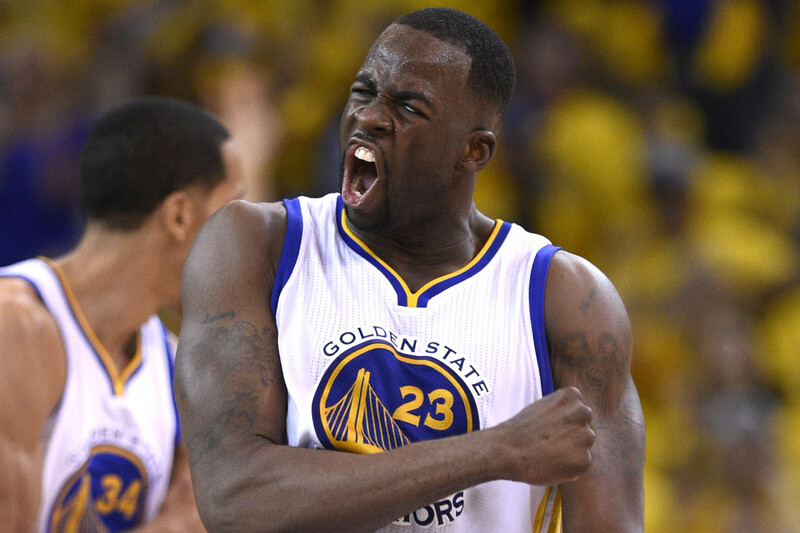 All-star Forward Draymond Green tweaked his knee in the season opener, and will undergo an MRI. Golden State Warriors forward Draymond Green was diagnosed with a left knee strain and missed the final quarter of Tuesday night’s season-opening loss to the Houston Rockets. After the champs blew a 17-point lead, Kevin Durant’s potential buzzer-beater was waved off as the Rockets stunned the Warriors in a season opener. Toward the end of the third quarter, Green was fouled during a running jumper and landed awkwardly. He immediately began hobbling and rubbing his left knee. Moments later, the quarter buzzer sounded, and he retreated to the locker room. Green told ESPN’s The Undefeated on Tuesday night that his knee was “very sore.” He was able to walk under his own power and said he didn’t think the injury was major. “I’ll be good. I’m fine,” he said. Green is getting an MRI on his left knee Wednesday. He had 9 points, 11 rebounds and 13 assists in 28 minutes during the 122-121 loss. It’s no coincidence the Warriors’ defense fell apart in the 4th quarter against the Rockets where they were outscored 34-20 in a one-point loss. Although Green isn’t the marquee offensive player that Steph Curry, Klay Thompson, and Kevin Durant are, his value cannot be overstated. In addition to his ability to spread the floor with his three-point shooting, he’s an integral part of the Golden State’s defensive system. The switch-heavy defensive scheme that the Warriors utilize simply would not be possible without Green’s ability to contain centers and guards alike, and that’s exemplified by his defensive rating of 99.3, which leads the league among all qualified players who average at least 20 minutes per game. That means that the Warriors have allowed an average of 99.3 points per 100 possessions with Green on the floor this season, but that mark actually pales in comparison to how stout Green was in Kevin Durant’s absence after the perennial All-Star went down with a knee injury on the last day of February. One would naturally have expected Golden State’s defense to suffer without their leading shot-blocker and defensive rebounder, but the exact opposite proved to be true, thanks in large part to Green’s ramped up play on that end of the floor. In the 19 games Durant missed due to injury, the Warriors posted a defensive rating of 97.0 points per 100 possessions with Green on the court, nearly 10 points fewer than the league average over that span. The 2015-16 Warriors set the all-time regular season win record with 73, but were derailed in the finals, in large part to Draymond Green’s suspension in game 6; the Warriors’ defense faltered, and they couldn’t close out the series at home. Green doesn’t seem overly concerned about the knee injury, but the severity won’t be known until the results of the MRI. Several serious injuries have occurred when players come back too early and over-exert other body parts to compensate for the lack of strength in the ailing body part. The Chicago Bulls’ Derrick Rose torpedoed his career by rushing back from various injuries in 2012, then ultimately tore his ACL. He’s never come anywhere close to his MVP form since. Golden State’s regular season might be the most irrelevant regular season in sports history. Assuming the injury isn’t worst-case-scenario, the Warriors should be incredibly patient with Green to ensure the injury doesn’t nag and lead to something worse.